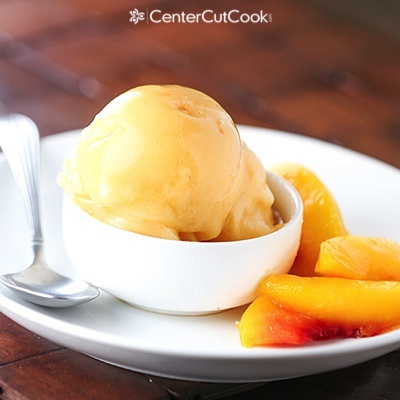 Delicious Peach Ice Cream made in the Vitamix is healthy, dairy-free, and vegan! This week it has been all about the Vitamix! It started with my review of the Vitamix 5200, followed by the fabulous Vitamix giveaway (there’s still time to enter! ), and several recipes throughout the week that can all be made with the Vitamix! 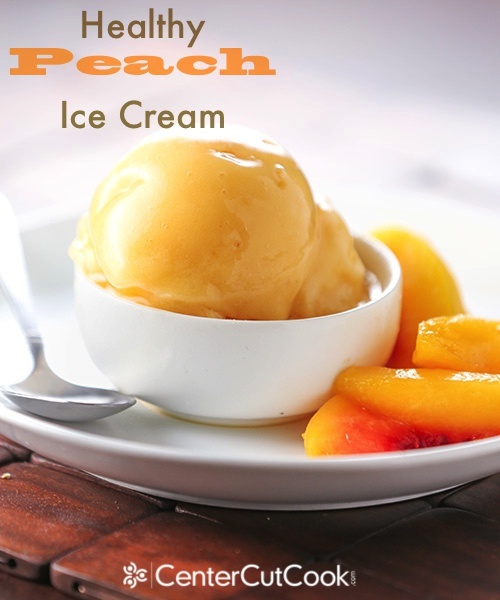 I decided to end the week with one of my favorite recipes for the Vitamix – Healthy Peach Ice Cream! Typically, making ice cream involves some type of dairy, and the use of an ice cream maker. This version? 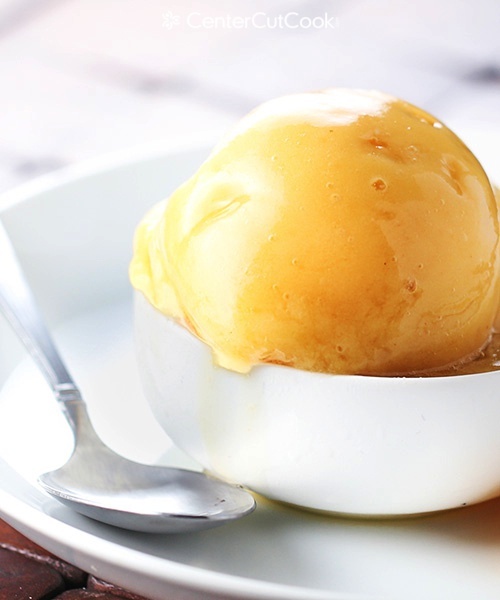 No dairy in sight which means this Healthy Peach Ice Cream is actually vegan. And no need for an ice cream maker, all you need is a Vitamix! From start to finish, this recipe literally takes about 5 minutes. You can’t run to Dairy Queen faster than that! You’re probably wondering if the taste and texture is the same as traditional ice cream, and the answer is.. not really. But is it as refreshing as ice cream? Definitely yes! I was first introduced to this recipe at one of those Vitamix road shows at Costco. The demonstrator was making this very recipe, and she tossed in squash, baby carrots, and cabbage, yet called it peach ice cream. Certainly it wasn’t going to actually taste like peach ice cream, I thought to myself. Boy was I wrong. Vegetables in ice cream? Say it ain’t so! I was absolutely blown away at how delicious this peach ice cream was AND the fact there are veggies incorporated! How cool is that? If you don’t have a Vitamix, I do not recommend trying this recipe in your blender as you need a super powerful machine, like the Vitamix, to get the same result. If you have a Vitamix, this is going to be one of those recipes that you’ll revisit over and over because it’s so simple, and delicious. Who knew dairy-free ice cream could taste so good? Place all ingredients in the Vitamix in the order listed. Turn the machine on high. Use the tamper to sweep from side to side to make sure all of the ingredients get pushed into the blades. Let it run until the mixture becomes one color and you see four mounds form. This should take about a minute to a minute and a half.